The sun sets as waterfowl flying near Red Hill Marina on the Salton Sea, California on the 19th March 2015. Sun sets as waterfowl flying near Red Hill Marina at Salton Sea, California on March 19, 2015. The sun sets as waterfowl flying near Red Hill Marina at Salton Sea, California on March 19, 2015. 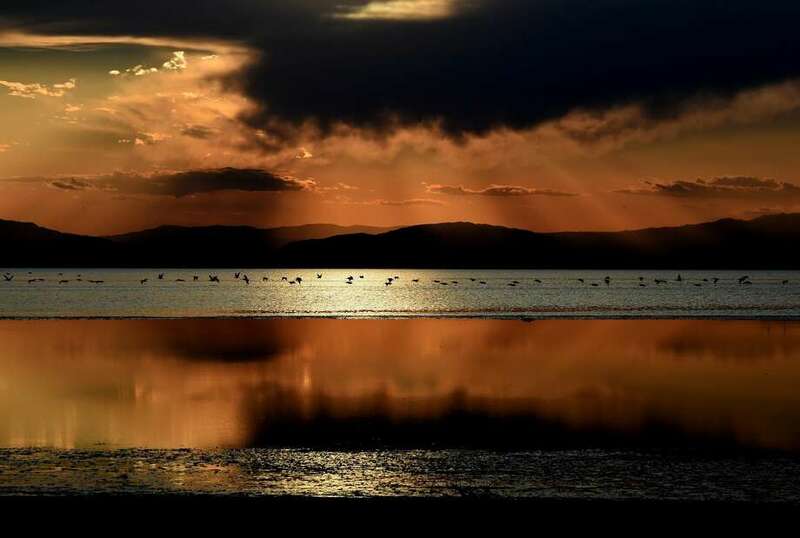 SALTON CITY, California – Authorities say thousands of migratory birds have died in California's Salton Sea this month from avian cholera. The California Department of Fish and Game says that ducks, gulls and other birds were found dead at the southern end of the state's largest lake between 8 and last Thursday. Test showed signs of avian cholera, an infectious bacterial disease. It spreads through direct contact or from contaminated food or water. Wildlife officials say eruptions occur annually as a result of birds flocking closely together during migration. The lake is 350 km located in the desert near the Mexican border. It is a regular stop for migrating birds.